On November 28, 2012, FEMA Administrator Craig Fugate announced his selections for the 2012 Administrator Awards. Among those included for recognition for "Innovation" was the FEMA GeoPortal Development Team. With little fanfare, the team has built out a publicly available disaster geospatial data portal on an ESRI hosted site. When Hurricane Sandy hit in late fall, the team was able to leverage past work and deploy a truly substantial capability. In the video of the award presentation below, the following time points are worthy of note: Team Award - 27:13; Administrator Fugate's overall comments - 31:16-37:35; Administrator Fugate's comments on the value of geospatial - 35:20. 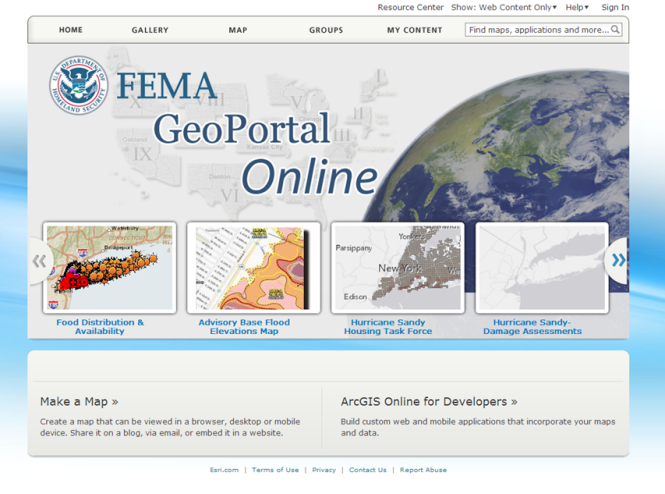 Link to the FEMA GeoPortal Online can be found below the video. A point of confusion - Why isn't the FEMA GeoPortal Online prominently mentioned on FEMA's main website for Hurricane Sandy or on any of the supporting websites? Well down the page I see the site link above the only other "Interactive Maps" site mentioned - Google's Crisis Map. That makes it look like the FEMA GeoPortal Online doesn't really have official blessing. Same point when hitting the website - where is the "About" that would tell me this is the real deal? Or, are the boys and girls at the top only willing to stick their toes in the water with this electronic mapping thingy? Per the various viewers at the site - how about a consistent use (that would be a "standard") of one coordinate system so that everything works together. On May 28, 2009, the leadership of the Disaster Operations Directorate (now Associate Administrator for Response and Recovery) officially endorsed use of the U.S. National Grid on all FEMA map products. What's the hold up? For example: Advisory Base Flood Elevation Map, dated December 7, 2012 versus Hurricane Sandy Housing Task Force. Anyway, enough foolishness from me. We are pulling for you in the hinterlands and wishing you all the best on further development of this much needed capability for FEMA and the public.